Shell Building #5 is located in the Rockingham West Industrial Park and sits just west of the City of Rockingham, NC. There is approximately 17+/- acres with the building--however there will be 33 total acres available for larger development. The industrial park is home to companies like Piedmont Natural Gas, CAI, Viking Pools and General Glass. 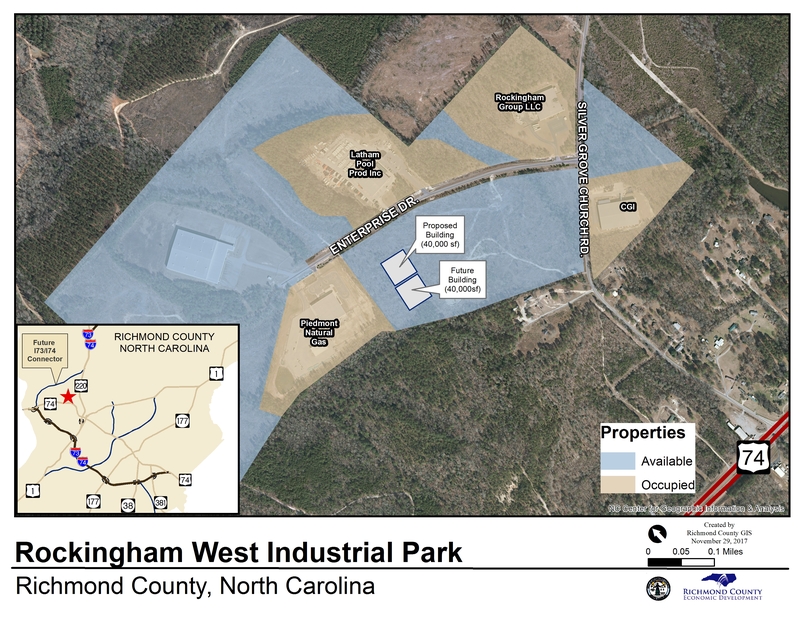 Minutes from Interstate 73/74 by way of US Highway 74, Rockingham West Industrial Park is just 70 miles to Charlotte and 80 miles to Greensboro. Electricity is provided by Pee Dee Electric or Duke Energy. An 8" water line (Richmond County) serves the park. Wastewater service is available thanks to the City of Rockingham (8" line). And telecom services are available through AT&T. Natural gas is available through Piedmont Natural Gas. 40k sq. ft with the ability to expand to 120k An additional 16 +/- acres available for expansion for a total of 33 +/- acres.